This is my 3500th Review!!!! Thanks to Toby of The Film Blog for this recommendation. Brief Synopsis –A newspaper editor tries to convince his best reporter, who also happens to be his ex-wife not to quit her job and get remarried. My Take on it – This will be the 4th film that I’ve seen based on the original play and this is by far the best of the lot. The rapid-fire dialogue is great to watch because it works so well here. 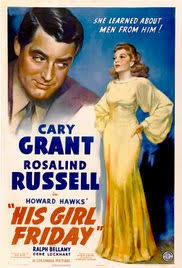 Cary Grant and Rosalind Russell are perfect together and have such amazing chemistry together. Their constant banter is dolled out to perfection and the viewer never wants to miss a beat as it happens. The idea to have the characters talk over one another helps make us want to make sure that we don’t miss any of this amazingly presented dialogue. The story itself works really well here and it’s so much easier to care about the characters and their situations here than in the other versions. Bottom Line – Of the numerous remakes of this story that I’ve seen, this is the best of the lot. Grant and Russell have amazing chemistry together and their banter is delivered to perfection. The script is great and the fact that the characters constantly talk over one another helps make this rapid fire dialogue work so well. The story itself is presented really well and unlike the other versions, this one really makes us care so much more about what is going on. Highly Recommended! Rob – hearty congratulations on your 3500th review. Well done. Congratulations! Glad you liked the film!